from ice hockey to dance, figure, and freestyle. any hollow-ground or flat-ground blade. EXACTLY THE WAY YOU WANT! Easily replaceable with no tools required. OR AT ANY ANGLE YOU CHOOSE. SkateMate® guarantees sharp blades without costly grinding jobs that not only waste your time and money, but waste away your expensive blades, as well! I thought up this bright idea to save myself aggravation. Now, it has been redesigned to save you both time and money, since the flexible abrasive cylinder sharpens only the blade edges. It doesnt grind off the entire blade inch by inch, and dollar by dollar, which is exactly what high-speed abrasive wheels do every time. 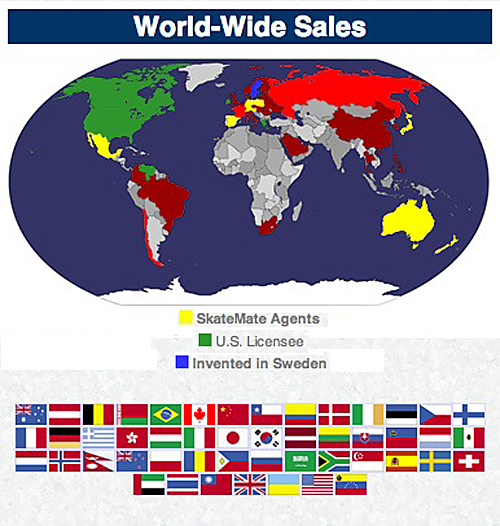 If youre looking for a precision tool, ask for SkateMate. YOUR BLADES WILL LAST YOU MONTHS AND YEARS LONGER! The adjustable blade guides are covered with tough, smooth PP-polymer for effortless sliding action and to prevent scratching highly polished, expensive blades. The near frictionless PP-polymer also allows for a snug fit and greater sharpening precision. Competitive handheld devices with rigid gaps, and thus loose fit, will wobble and may actually round off blade edges instead of sharpening them. The patented flexible ceramic-abrasive cylinder is designed to adapt under slight pressure to sharpen almost any hollow-ground blade [figures, freestyle, dance, etc.]. Also shallow ground goalie blades. And it will work on all thin flat-ground blades [racing, tour, speed, etc.]. SkateMate uses no messy oils nor expensive solid whetstones, which soon become grooved, worn-out and useless. Instead, the tough long-lasting cylinder is simply turned to a fresh surface, or quickly and easily replaced by turning open the sharpener sides until the patented holder drops free (no tools required). Cylinders are replaced quickly and inexpensively without tools. NEW DESIGN! A tough, flexible Mylar foolproof centering cradle has now been added to the cylinder holder to guarantee spot-on alignment no matter how or where you sharpen your blades!! Skate anytime, anyplace with the cutting edge of a real cool pro. ROHs of 5/16" and 3/8". Competitive handheld sharpeners need half a dozen expensive models to do what this unique invention does all in oneand better. This is the result of more than two decades of trial, testing and refinement in Scandinavia. This is why this flexible handheld sharpener has the edge on the competition both in performance and in overall total price! Save time, money and unnecessary irritation by expertly honing all your skate blades yourself. Youll get your investment back after only 4 or 5 sharpenings. And, when you dont have to grind and grind and grind, youll soon see how much longer your expensive blades last! OUR GUARANTEE: IF YOURE NOT SATISFIED, YOULL GET YOUR MONEY BACK! There are countless theories afoot about how to sharpen hockey, figure and dance skates, etc., but for basic info about the right ROH.
. . . and skate sharp! from old-fashioned speed skates to the thinnest modern blades. And by ordering just a couple extras, it becomes a true "3-in-1". & true testimonials from many satisfied customers. Rainbow Technologies [ Last update: 20 March 2019 ].